The JF-17 Thunder (Urdu: تھنڈر), also designated Chengdu FC-1 Xiaolong (English: Fierce Dragon; Chinese: 枭龙; pinyin: Xiāo Lóng) is a single-engine, light-weight multi-role combat aircraft developed jointly by the Chengdu Aircraft Industries Corporation (CAC) of China, the Pakistan Air Force and the Pakistan Aeronautical Complex (PAC). 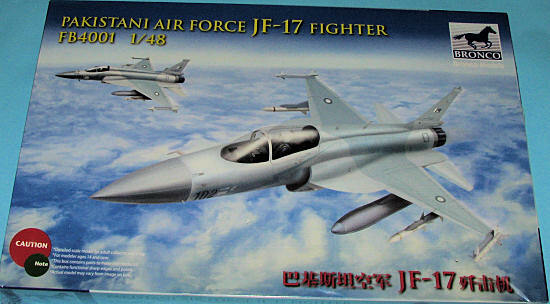 It is designated as "JF-17" by Pakistan, which is short for "Joint Fighter-17" and as "FC-1" by China, which is short for "Fighter China-1". Pakistan and China signed the Letter of Intent for the joint development of the JF-17 (then called "Super-7") in 1998, followed by the signing of the Contract in 1999. The project got delayed due to the inability to find an avionics and radar package. In 2001, the Pakistan Air Force recommended that the airframe design be de-coupled from the avionics and radar systems for the aircraft to avoid further delay. This resulted in a fresh impetus to the project and the design was finalized and 'frozen' in 2001. The maiden test flight of the first prototype took place during 2003 in China, later test flights with a modified design with Diverterless Supersonic Intakes (DSI), and a modified tail design took place in 2006. Deliveries to the Pakistan Air Force for further flight testing and evaluation began in 2007, the aircraft's first aerial display also taking place that year in Islamabad, Pakistan. The Pakistan Air Force officially inducted its first JF-17 squadron on 18 February 2010. The JF-17 is expected to cost approximately US$15 million per unit. The Pakistan Air Force has announced that it has a confirmed order for 150 JF-17s, which may increase to 250 aircraft. The JF-17 will replace Pakistan's MiG-21-derived Chengdu F-7, Nanchang A-5 and Dassault Mirage III/Mirage V aircraft currently in service. Azerbaijan, Zimbabwe and eight other countries have expressed interest in purchasing the JF-17 at a recent military exhibition in Pakistan, according to an official. 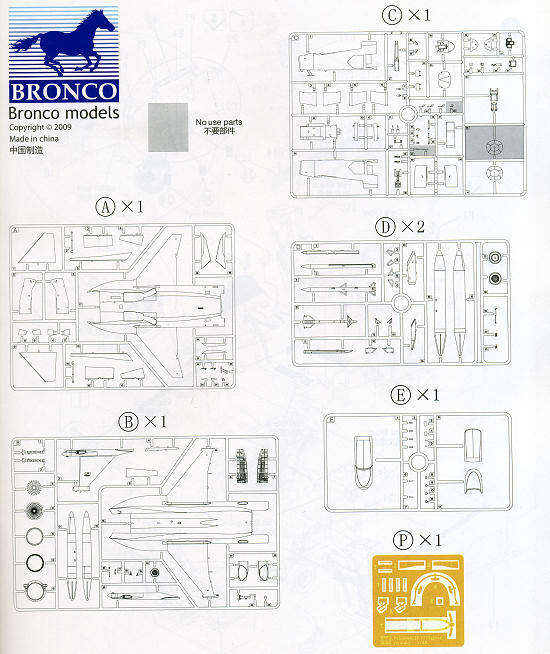 This is Bronco's first 1/48 kit and it is an aircraft that I believe no one else has done in this scale. If you have seen the more recent kits from Hobby Boss or Trumpeter or Dragon, then you have a pretty good idea at what the molding is like. There are six sprues, five grey and one clear. All of them are individually bagged, including the duplicate sprues for the drop tanks, missiles, wheels and some other items. The main fuselage is split horizontally, with a separate vertically spit nose, undoubtedly to take care of a future two seat variant. The cockpit is well done and has a nicely molded bang seat that is in several sections. There is a photo etch sprue that takes care of the seat harness, instrument anti-glare hood and a few other bits, including the canopy rear view mirrors. A separate control stick and rudder pedals are provided. The kit can be built with the canopy open or one can use a one-piece closed canopy so this will determine how the canopy opening mechanism will be built. Both canopies have a seam running down the middle and while the one on the canopy section is supposed to be there, the one on the windscreen will need to be removed. Interestingly, the box art shows this seam, but I doubt if it is really there on the actual aircraft. 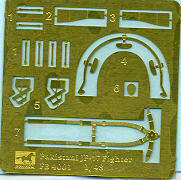 There are also two different radomes in the kit, though only one will be used. No indication is provided if nose weight will be needed, so it is nice having the separate radome. Intake trunking leading to a blanking plate is provided. The gear wells and landing gear are very nicely formed and are multi-piece constructs. The kit provides separate control surfaces, though it appears these are to be assembled in the neutral position. Weapons load is a pair of Sidewinders and a pair of AMRAAMS, or something similar. There is a centerline gun pod as on a MiG-21 and there are three auxiliary fuel tanks; two under the wings and one on the centerline of the fuselage. One does not have to install all these as it is up to the modeler to open the appropriate holes in the underside to mount these. I appreciate this as I don't always want to install everything on a model. Instructions are well drawn in a slick paper booklet that has 16 construction steps. Color information is provided throughout the build. There are color references for a number of paint companies. The lone markings option is for a plane of the recently operational unit for this aircraft. 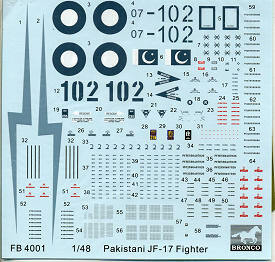 Colors are pretty much Light and Dark Compass Ghost Grey in a pattern similar the the PAF's F-16 fleet. Decals appear to be well done and provide markings for the box art aircraft. 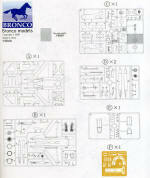 There are the usual mass of stencil decals with the instructions providing a guide for these. What with the large reductions in military hardware budgets and the increasing price of modern aircraft, finding new subjects is not an easy task for the modern military aircraft fan. This one should fit right in and appears to be a well engineered kit to boot.